Paradise lost is found in La Fura dels Baus epic production on the harbour. 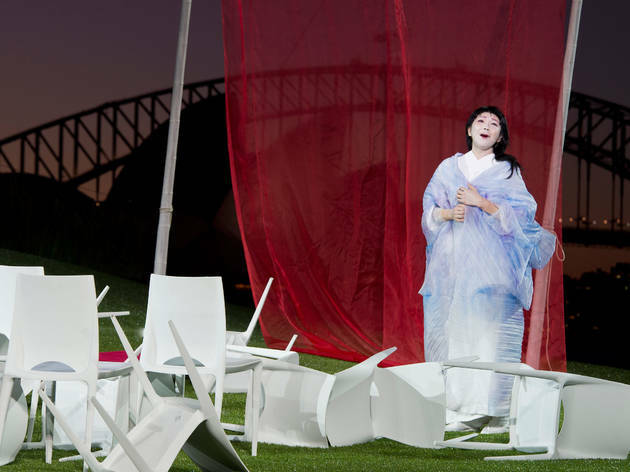 Opera Australia's third annual Handa Opera on Sydney Harbour is a world-beating triumph, surely one of the most spectacular outdoor operas ever staged anywhere. But it's not just pomp and glitz: although Catlan director Alex Ollé and his company La Fura dels Baus have a global reputation for large scale shows, he still presents a highly intelligent and original take on Puccini's now clichéd tale of a poor Japanese teenage bride used and abandoned by the scoundrel Lieutenant Benjamin Franklin Pinkerton. Many of the legendary outdoor performances of the operatic canon have been in the real locations specified in their fictional librettos: Turandot in the Forbidden City, Verdi's Aida in Egypt or even the Pavarotti movie ofTosca shot in Rome. The contrarian Ollé here discards the libretto's very Italian orientalism, and gives Puccini a maximal dose of his own verismo by keeping it real and making it contemporary. He transposes Butterfly from her home town of Nagasaki around the time Puccini set librettist Luigi Illica's adaptation (1904) to the here and now of Sydney with our prevailing domestic dreams: a harbourside outdoor wedding, shoddily built flats with water views bought off the plan, cranes bearing the phone numbers for enquiries, a familiar taxi. Set designer Alfons Flores follows the East Asian landscaping idea of "borrowed scenery" to make two square kilometers of Port Jackson his stage, incorporating vast distances to express the theme of separation. The result of the creative team's appropriation of familiar elements to convey the emotions of this essentially simple drama is tremendously powerful. Many people cry; most stand at the end to salute this monumental yet immediately assimilable vision. The creative team of La Fura dels Baus previously scored big with A Masked Ball for Sydney Festival 2013 in the too-small Joan Sutherland Theatre of the Sydney Opera House. Here they hit the jackpot on the visuospatial front, on the acoustic side OA faced a mission impossible to get theatre quality sound outdoors, despite the great strides that have been made in sound engineering in the last decade. It's still obvious that the cast is packed with magnificent voices and excellent vocal technique, but evaluating singers through speakers is like valuing an oil painting from a photocopy. 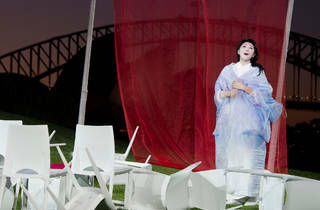 Resigned opera tragics know from Omura's global reach and her performance in Moffat Oxenbould’s production for OA that we are witnessing one of the finest artists living for the role, even if in the botanic gardens it often seemed amplified too loud. To novices, it's like a musical with extremely good singers and subtitles. Brian Castles-Onion conducted with his usual vim and panache the wonderful Australian Opera & Ballet Orchestra, entombed beneath the grassy knoll of the central set: if you can tear your eyes away from the harbour setting, look behind you and follow his baton on a huge TV monitor placed on scaffolding for the benefit of the singers scattered along the shore of Farm Cove. The famous humming chorus is terribly moving: dispossessed immigrant construction workers slowly file home to their shelters. The DVD with close-ups of these unfortunates should be extraordinary, but to miss this show before it closes would be passing on one of the greatest nights of live entertainment ever offered in Australia. And the food's really good too.